The sudden, recent news of the passing of Greg Ham, saxophonist/flautist and founding member of Australian rock band Men at Work, comes at a strange and sad time. Yesterday in fact marked the 30th anniversary of the release of the band’s breakthrough debut, Business As Usual, in America. More importantly, though, it’s the sad loss of a figure who contributed a lot to early ’80s rock music. It’s interesting, then, that the band only had three studio albums to their credit, making for a pretty swift overview by way of reissues and compilations. Join us in paying tribute to Hay, Ham and the rest of Men at Work with this special Back Tracks trip down memory lane. It’s less common now, but there was a time when overnight success was harder to grasp. Business As Usual was that kind of an album in America: it wasn’t released on our shores until the spring of 1982, about six months after its Australian release – and it didn’t start having any effect on the charts until the end of the year. But when it did, everyone knew about it. Business As Usual topped the Billboard charts for 15 weeks in 1982 and 1983 – more than the album’s stay at No. 1 on the U.K. and Australian charts combined. While you could certainly argue that the success of Men At Work was exacerbated by the current pop/rock landscape (the biggest international rock band at the time was arguably The Police – to which Men at Work ostensibly owed their semi-reggae sound – and they hadn’t recorded an album since 1981, a lengthy break in pop terms), there’s no getting around the fact that Business As Usual bears some great tunes. In addition to the still-played No. 1 singles “Who Can It Be Now?” and “Down Under,” you’ve got some catchy tracks in “Underground,” “Be Good Johnny” and “I Can See It in Your Eyes.” It’s a considerably fat-free New Wave album, which lends to its appeal to this day. 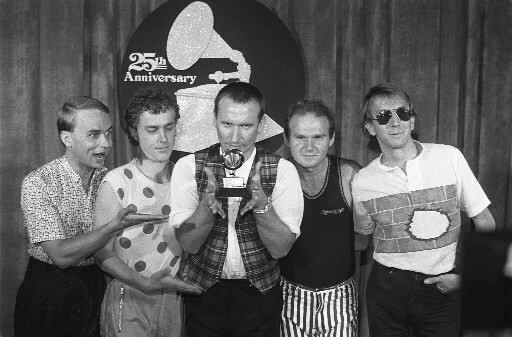 With a Grammy for Best New Artist, six million copies of Business As Usual sold in the U.S. and competition running high (Business As Usual was succeeded in the charts by Michael Jackson’s Thriller, and The Police had ended their period of silence with their last and most successful LP, Synchronicity), there was likely a lot of pressure for Men at Work to succeed a second time. Happily, they did – Cargo, which sold about half of Business‘ intake, was bolstered by a handful of hits, including two of their most underrated singles (“Overkill” and “It’s a Mistake”). “Dr. Heckyll and Mr. Jive was another Top 10 hit for the band, while songs like “High Wire” were also strong if somewhat formulaic. Cargo was reissued alongside Business As Usual in 2003, this time including every relevant studio B-side on the disc and adding three vintage live performances, two of which were from singles, and one of which (“The Longest Night”) would appear on a foreign compilation and provide a crucial signpost for fans of the band in years to come. Were the wheels starting to fall off for Men at Work by the middle of the decade? Arguably so: before convening to record the album, bassist John Rees and drummer Jerry Speiser were unceremoniously fired from the band. Strykert quit partway through recording what would become the group’s final studio album, and Ham would depart by the end of the tour. And to make matters worse, Two Hearts isn’t even a beautiful disaster. It’s just not that good. So not that good that it only went gold in America, and it’s never been reissued past its original pressings on CD. (Any theoretical bonus material would be consigned to extended remixes of singles “Hard Luck Story,” “Maria” and “Everything I Need” – the only such mixes commissioned during the band’s lifespan.) All in all, an ignoble end to a promising band. Amid a number of substandard budget compilations (1995’s Puttin’ In Overtime) and generic ones under Legacy’s various hits series, Contraband may not be the best for a new fan – five tracks from Two Hearts is pushing it – but it’s got a decent non-chronological flow to it. And it has one bonus track, a live version of “I Like To” from Cargo that was previously released on the B-side to the “High Wire” single. Among the aforementioned “generic compilations,” these might be the best for a new fan to start. Essential is the closest to chronological (even then, it’s really not – it sort of weaves Cargo and Two Hearts together), and an Australian edition includes a few bonus tracks (including that aforementioned extended “Down Under” and a lot more album cuts) and a DVD of music videos (the only one of its kind). Playlist, meanwhile, includes something from every one of the band’s four main releases, including “The Longest Night” and a live track from Brazil. While “Two Hearts” is a lackluster album, “Everything I Need” (the first single in America) is one of my favorite songs by them. Two Hearts is hugely underrated and one of my favorites by the band. It also features several great songs by Greg Ham, Still Life, Snakes & Ladders and Stay At Home…. It is a big swerve from their first two discs but actually shows a lot of growth and possibility for the future, it’s a shame it wasn’t explored further. Even thought I grew up in the ’80s, I never paid much attention to Men at Work. I only recently became a fan, and their music is excellent. It’s a shame they only released three studio albums. “Overkill” is an incredible song, one that I think is better than either “Down Under” or “Who Can It Be Now?” The ‘Essential’ set with the DVD is worth getting. I would say to all of you who’ve enjoyed Men At Work’s output, that Colin Hay’s solo work has really been criminally underrated. You really should check it out.